Mosquitoland by David Arnold is an unusual story of a teen girl who runs away from her "new" life to take a bus--alone, and using stolen money--back to her old home halfway across the country. Her journey is fraught with obstacles, but it's one that she must complete because it could very well be a matter of life and death. Mim (Mary Iris Malone) knew that something was going on between her parents long before they dropped the bombshell on her that they were getting divorced. She never expected to have move away from her home in Cleveland, leave her mom behind, and make a new life with her dad and his new wife in deepest, soggiest Mississippi. After learning that her mother is not well, she discovers that her father and stepmother have been secretly working to cut her communication with her over several months. Mim snaps. 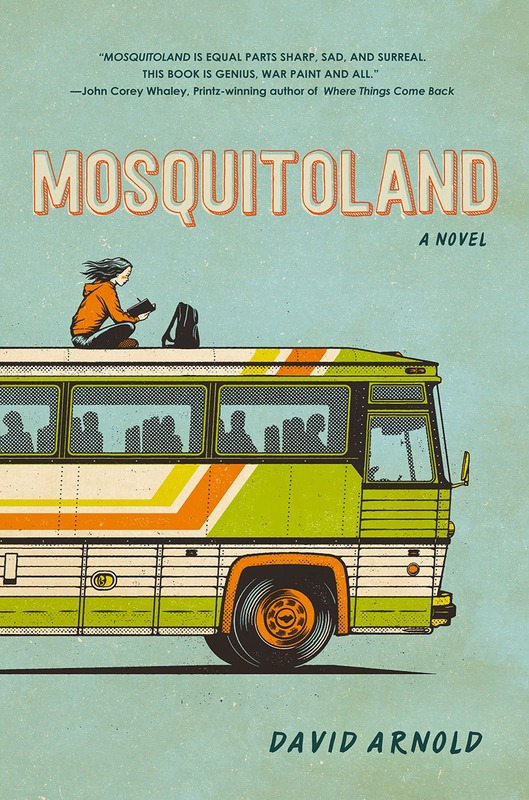 She takes some cash hidden in the house, buys a ticket for a Greyhound to Cleveland, and vows to leave the misery of Mississippi (or rather Mosquitoland) to be with her mother during her last days. What follows is an hilariously-surreal adventure set on the highways between the deep South and Ohio. Peppered by a cast of flawed-but-heartwarming characters, David Arnold's adventure story of a teenage runaway manages to transform into something far greater when Mim learns that the people you should trust and the people you do trust are not always the same. I enjoyed Mosquitoland primarily because of David Arnold's very real and very unreliable voice for his main character. Seeing things tinted by her perspective makes me wonder what kind of sorcery the author has access to in order to so accurately write from the point of view of a teenage girl. I also loved the larger than life people Mim encounters on her journey to Cleveland. They are exactly the types of people that one both hopes and fears meeting on a solo bus trip. Because of the surreal feel of the characters and the dark cloud of depression that hovers around Mim, I found Mosquitoland to be a story much like Big Fish meets Girl, Interrupted, which from me is glowing praise. Have you read it? Do you plan to add it to your wishlist soon? I'd love to hear what you think in the comments!